She wants an offer no one can refuse. The judge who will rule on jailed mobster Thomas “Tommy Shots” Gioeli’s $10 million case against the feds for a prison rec-room slip-and-fall wants the two parties to settle. 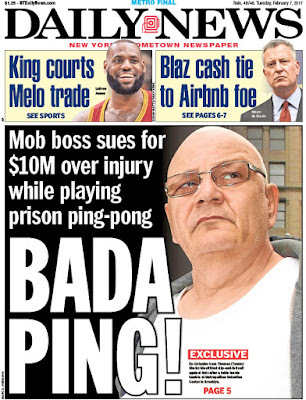 Gioeli is suing the feds because he broke his kneecap after slipping on a puddle while retrieving an errant ping-pong ball during a game at the Metropolitan Detention Center in Brooklyn in 2013. But Brooklyn Federal Court Judge Kiyo Matsumoto nudged the two sides to strike a deal, rather than forcing her to issue a bench ruling on the case. Matsumoto indicated both sides may be at fault for the injury — the lockup for not addressing the underlying cause of the puddle, and Gioeli for chasing the ball into an area he knew was hazardous. Gioeli, who has since been moved to a federal pen in North Carolina, is serving 18 years on a racketeering conviction. He was convicted in 2012 of plotting the murders of gangland enemies and a general charge of orchestrating violence against rivals to gain power. But Gioeli was acquitted of several murders in that case that could have sent him to jail for life, including the 1997 hit on NYPD cop Ralph Dols, who was rubbed out allegedly because he married the ex-wife of Joel “Joe Waverly” Cacace, a former Colombo consigliere. Gioeli and Colombo soldier Dino Saracino were also cleared of the 1999 slaying of Colombo underboss William “Wild Bill” Cutolo, and the 1995 execution of Colombo associate Richard Greaves. Both sides have until July 18 to make submissions laying out the facts of the case — then they’ll be given two weeks to respond to one another before Matsumoto can issue a ruling.